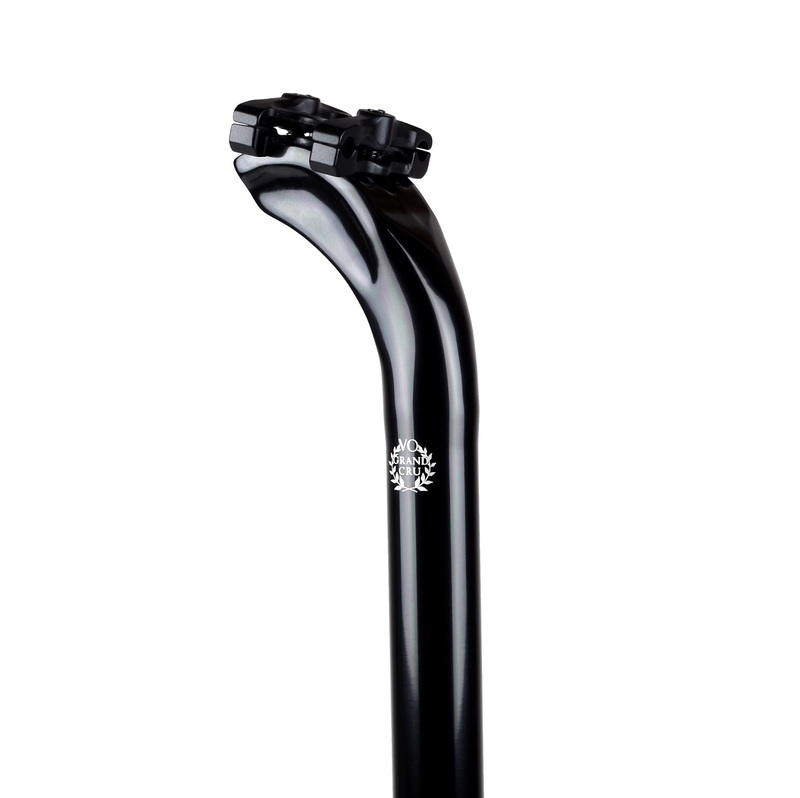 We've offered the VO Long Setback Seat Post since 2008. It's a great post, especially so for folks who use leather saddles, which usually have shorter rails than plastic saddles. It's also nice for those who like a slacker seat tube angle, getting the saddle further behind the crank. But after all these years we decided it was time for an update. So after much design work and testing we recently introduced the MK 2 version. The new version has a few advantages. It's stronger. It's easier to adjust. And it has a larger purchase area on the seat rails, which minimizes seat rail scuffing. But we kept the best features of the original design. The post and head are still one piece, not pressed on like cheaper posts. The post is still internally ovalized for light weight. It still uses a two bolt design that adjusts from the bottom. The clamps mating surfaces are smooth, not notched, for fine adjustment. And there is still a generous 30.2mm of setback, just like the first version. 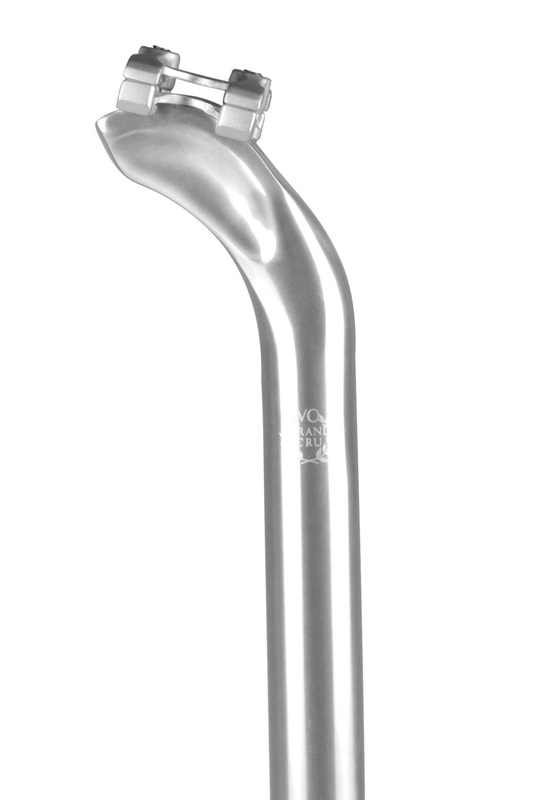 The new version is available in silver or in black, but only in 27.2mm diameter and 300mm length. The Grand Cru Rear Cassette Hubs have been a favorite amongst cyclotourists and randonneurs for their simplicity, reliability, and easy serviceability. 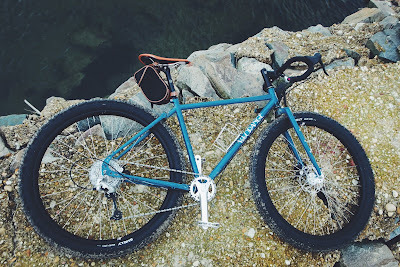 The hubs use high-quality Japanese sealed bearings, a hub body design of our own, and a 10-speed compatible steel Shimano splined freehub body (or your choice of Campy or alloy). The freehub body features 3 pairs of robust pawls. Undo the quick release or anti-theft skewers and remove wheel from the dropouts. Remove quick release from the axle of the hub and set aside. Remember, when you pull the freehub body/cassette away from the shell, the non-driveside endcap will be freed, so put it into your pocket. You can pull the axle off the freehub body as well, but it's not necessary. The driveside endcap will stay on the axle by friction because of the rubber seals, but keep an eye on it. Better yet, put it into your pocket. Now that you have the freehub body off, you can do a cleaning of the driveside flange (this always gets over-looked), the pawls, and the ratchet ring. If you've broken a spoke, replace the spoke. Use a clean rag and wipe the pawls in the direction of engagement. Inspect the spring of the pawls. Clean off the ratchet ring, quick wipe will do here. Apply a small dab of thin gear oil to each pair of pawls. Chain lube works fine. Phil Tenacious oil works very well, too. Don’t use thick grease because the pawls may not pop back up! Insert the axle into the shell and reassemble. Don’t forget about the endcaps in your pocket! Give the cassette a quick spin to ensure good pawl engagement. Put the wheel back into the dropouts and tighten the skewer. Hop on your bike and enjoy! The Constructeur-Style Rubber Grips are the perfect finishing touch for Adrian's 1970 Bertin mixte. The only snag is that they are designed to work with flat handlebars that do not use bar-end shifters. So here's how we modified the grip to work with her setup using just a knife, sandpaper, and denatured alcohol. Install the grip onto an old handlebar or pipe. Using alcohol makes installation significantly easier. Start cutting just behind the bulge and go all the way around. Use a small piece of sandpaper to smooth out the rough edges from the cut. With the shifter, cable, and housing installed, shift the rear derailleur into a lower gear so the lever is inline with the bars. Use generous denatured alcohol to start sliding/twisting the grip over the shift lever and over the housing until it's in the proper position. After installation, let the grip rest for 24 hours so the alcohol evaporates and the grip stops rotating. I really like Mafac brake levers. They are a little wider than most classic levers and better fit my hands. The hoods are also thicker and more comfortable than the Italian type. Most constructeur bikes used these levers and often had these cool half-hoods. These hoods attach with a metal clip that fits into the little recess on the back of Mafac levers. The originals are very rare and expensive, so these French made Rustines hoods were sorely needed. Used Mafac levers, unlike the hoods, are common and inexpensive, not to mention very cool looking; you shouldn't have any trouble finding a pair. 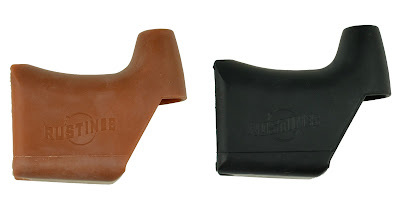 These hoods are available in gum and black, just like the originals. You may notice that the gum version is darker than the Campy-style hoods. 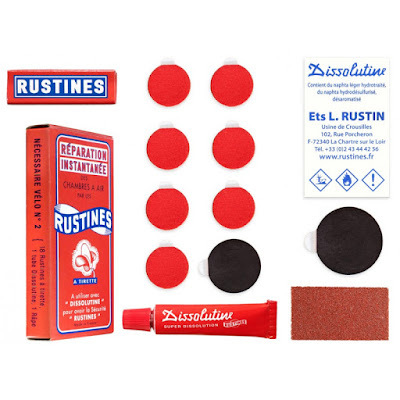 That's because the original French gum rubber was darker than the Italian gum; it's great the Rustines went to the trouble to replicate the original color. If you prefer full hoods, we have those, too. They are also available in gum and in black. These are even thicker and more comfortable that the half-hoods, though not as stylish. Also, we now have blue constructeur grips. 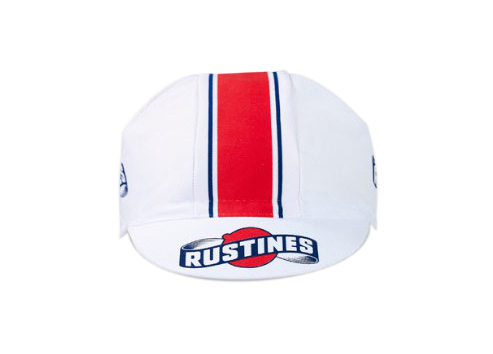 The Rustines stuff is selling really quickly and we may have trouble keeping everything in stock for the next couple of months. We're placing bigger orders and should have a steady supply soon. 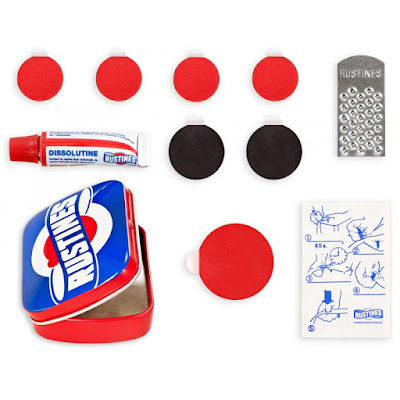 If you own a shop, get some of the patch kits; cyclists love them. We'll have more of the VO porteur bags later today, another item that's been selling out very quickly. Our very popular Course handlebar is now available in black. I really like these bars because of their open bends and long flat sections that offer a wide variety of hand positions. 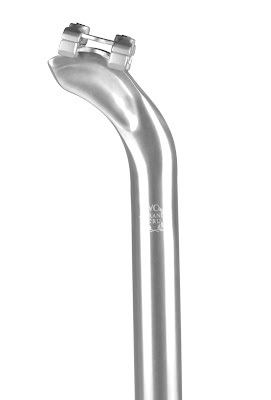 We have the VO 31.8mm stem in stock again. We had discontinued these, but folks kept asking for them so we made another production run. I wonder if we should do a black version? This is a rather expensive dropout we had made for an upcoming frame. We're pretty proud of the design; when you see the rest of the bike you'l know why. Many of you have asked for the Piolet geometry. You can now find it here. It's also listed on our frame comparison table. John and Kate attended the opening of the Marin Museum of Bicycling and Mountain Bike Hall of Fame. Check out their post and photos on the Grand Cruz Blog. You might also want to follow their Twitter feed and Facebook page. The French tall ship Hermione arrived in Annapolis yesterday. It was really cool to walk down and see her this morning. Lots of festivities and a parade are taking place. I hope to go aboard tomorrow. Hermione was a revolutionary war era ship that brought General Lafayette to America; without him we might still be a British colony. These are really nice CNC cut alloy stem caps with knurled edges. They are one of those little touches that make a bike special, particularly so when engraved with your name. Back in the day of French constructeur bikes the owner's name was often engraved on the top of the stem. We think that's great tradition and one that should be kept alive. So we'll engrave your name on the Grand Cru stem cap for $15. It only takes one business day to do and we can fit up to 22 letters and spaces total. The font is as shown above. Silver caps get black filled letters and black caps get silver. 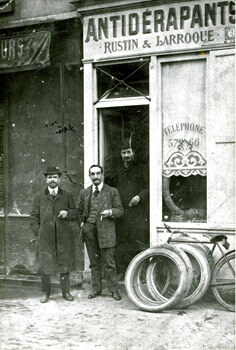 Rustines has been in the business of fixing tires for about 100 years. Louis Désiré Auguste Rustin (1880-1954) literally invented the tube patch kit. You can read their history here (Google translate). 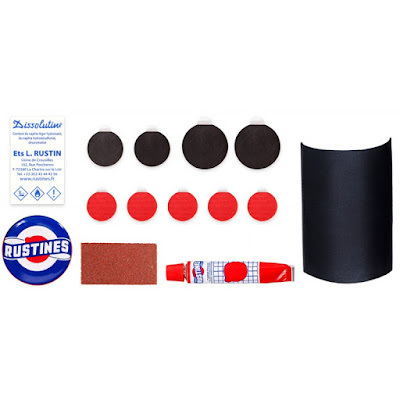 Mark, our resident flatter and expert on fixing same, says these are the best patches he's ever used, partially because the rubber is very flexible and stretchy. He now looks forward to getting flats (just kidding). Almost 100 years of development has to count for something. Plus you have to love the graphics on the packaging, especially on the tins. 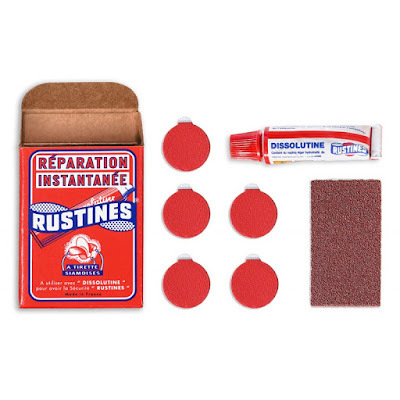 Rustines sticks patches on both sides of the release paper (to save weight?) Clever. So you get twice as many as you might expect. By the way, we'll have spare glue tubes soon. The #1 Patch kit is all you need for riding around town. Remember that each of those dots is two patches, so there are 10. Not bad for $2.70. The #2 patch kit offers a larger variety of patches with a couple of bigger ones, should you get a pinch flat. This small metal tin is my favorite. 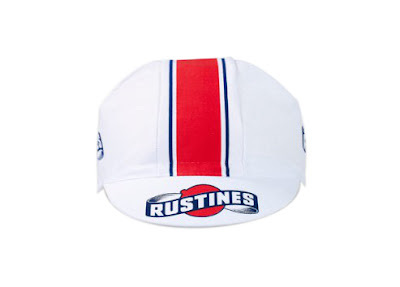 It's a reproduction of an old Rustines patch kit and it just looks so cool. I have one and plan to refill it with the inexpensive #1 kit as I use up the patches. This large kit in the neat cylindrical tin is another reproduction of an old kit. It's made for touring or to keep in your shop. In addition to the 18 round patches, it has a huge patch that could be used as a tire boot should the worse happen. Again, I would keep refilling it with the inexpensive #1 or #2 kits. If you have a shop you might put a basket of assorted Rustines kits next to the cash register. Folks just seem to love the look of them. Tres chic!